I was up with the sun today. Got in a 1/2 mile jog and added a mile and a half walk. Came home did the crunches- how I hate those- and leg lifts, weights etc. Now I feel all accomplished. My perennial gardens are in full swing at the moment. The Monarda is going crazy, the coneflowers are spectacular and the goldfinches, hummingbirds and assorted butterflies have descended on the garden in force. Here is a recent picture of one of the gardens. I need to get out there one morning this weekend and pull weeds. Early morning is best before it gets too blazing hot. The daylies are finished, my perky white daisies are done and the 'Moonshine' Yarrow has completed it's bloom cycle. But other flowers are filling in the gaps. The annual petunias, and my Joe Pye Weed, Black-eyed-Susans, the previously mentioned monarda and coneflowers. The roses are gearing up for another round of blossoms. Plus my snapdragons are about 2 feet tall and blooming away in all different colors. So what do I do with all the herbs and flowers in my gardens, you may wonder? Well, last week I went and gathered yarrow and rosemary and tied them into bundles and hung them in the windows of the house where they can dry and reinforce the wards to my home. There were a few things going 'bump in the night' around the homestead and I figured it was time to re-enforce the wards with some herbal magick. For fun I have been going out in the mornings and clipping flowers from the gardens to have in the house. I like the vibrations they bring indoors. Here is one bouquet that I made with the last of the daisies, and lilies. Magickal associations of this bouquet include; Tigerlilies- passion, Feverfew- good health, daisy- innocence, lambs ears- protection, Yarrow- all purpose magickal plant, purple coneflowers- health and fitness, red faerie roses- love and enchantment. In other news, I have been working away on three book projects... all at the same time. (Yes I know I should be commited.) Only a crazy person does that- or an author who has several ideas all shouting for her attention. But its been kind of fun- hectic but fun. So I decided to try and roll with it. For once in my life my Virgo tendencies to organize and schedule everything have been tossed out the window... So I am having to be more spontaneous and roll with the book ideas. I do confess I spent about a month fighting it and trying to organize- but oh well. Life happened. Well, that's it from here. I need to get back to those books. I hope you are all enjoying the bounty of your magickal gardens and are working some herbal magick for yourselves. If you'd like to learn more about herbal spells- I do offer an online class called "Herb Magick". It is very affordable only $30.00 dollars and you order it through Paypal on my website. 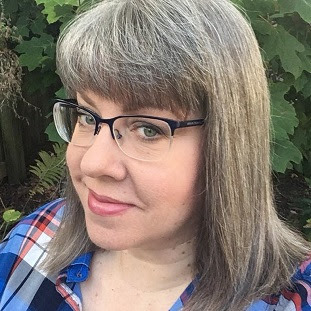 www.ellendugan.com Just click on the "Online Classes" tab at the top of the page to see all of the online classes that I offer. 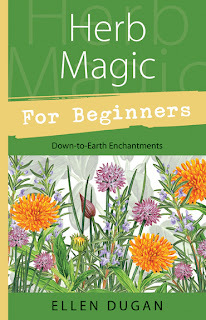 Here is my book that the online "Herb Magick" class uses for its text. The feedback on this class has been very positive. I bet you will enjoy it! Happy summer and happy magickal gardening! Your garden sounds beautiful and the bouquet is a riot of color. How lovely. It's always an extra treat when the garden brings birds and butterflies to it. 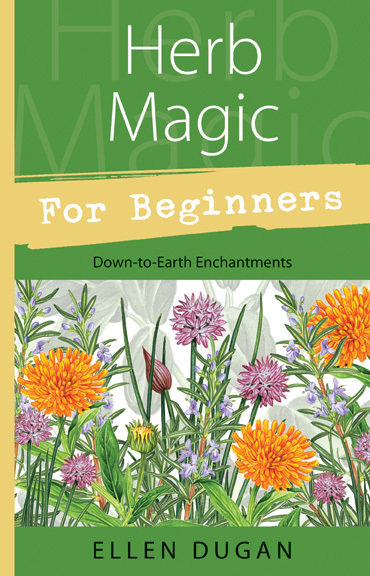 I have your Herb Magic book. It's great! Your garden looks wonderful and so does the little bouquet ! !